Eskaton communities ranked among the Best Nursing Homes in America by US News and World Report and received an abundance of honors from local publications and online review websites. Eskaton, a non-profit community-based organization serving seniors in the Greater Sacramento area for nearly 50 years, recently garnered a slew of top honors from a multitude of organizations. US News and World Report included Eskaton Care Center Fair Oaks, Eskaton Care Center Greenhaven, Eskaton Care Center Manzanita and Eskaton Village Carmichael Care Center in its Best Nursing Homes in America list. “Our staff is very proud of these honors and recognitions. For the past 50 years, we’ve been serving seniors in Northern California and the best reward is to be recognized by the people we serve,” said Todd Murch, President and CEO of Eskaton. Best of the best accolades were bestowed upon Eskaton by Caring.com and Sacramento Magazine. 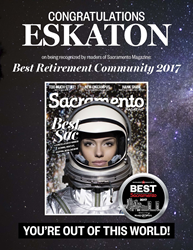 Caring.com awarded Eskaton with 24 Caring Stars for outstanding customer reviews and the readers of Sacramento Magazine named Eskaton as the top retirement community in the region for 2017. Eskaton was also recently voted Best of Carmichael, Best of Orangevale, Best of Roseville, Best of El Dorado County and Best of Nevada County by the readers of each local publication. To view a full list of Eskaton outstanding achievements, please visit https://www.eskaton.org/achievements.html. If you are caring for an older loved one, visit http://www.eskaton.org/signs to read about the signs it’s time to get help.